Location. 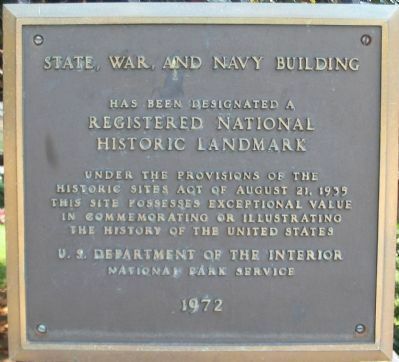 38° 53.912′ N, 77° 2.311′ W. Marker is in Downtown, District of Columbia, in Washington. Marker is at the intersection of Pennsylvania Avenue and West Executive Avenue, on the right when traveling east on Pennsylvania Avenue. Touch for map. 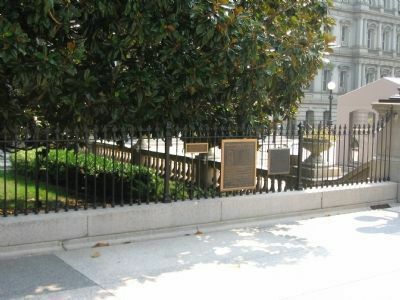 Located on the north side courtyard fence for the Old Executive Office Building. Marker is in this post office area: Washington DC 20005, United States of America. Touch for directions. 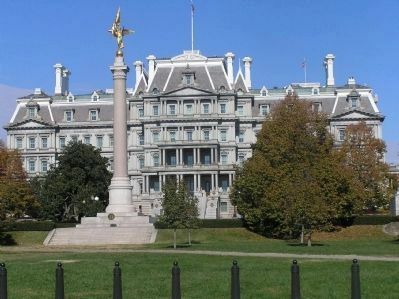 from this marker); Dwight D. Eisenhower Executive Office Building (a few steps from this marker); The Lee House (within shouting distance of this marker); First Home of the Reserve Officers Association (within shouting distance of this marker); In Honor of Leslie Coffelt (within shouting distance of this marker); The Blair House (within shouting distance of this marker); The Entrance Gardens (within shouting distance of this marker). Touch for a list and map of all markers in Downtown. Additional keywords. 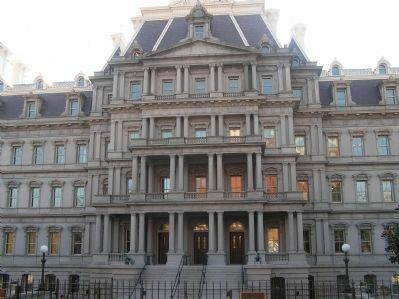 "Eisenhower Executive Office Building"
3. Old Executive Building (north face). 4. 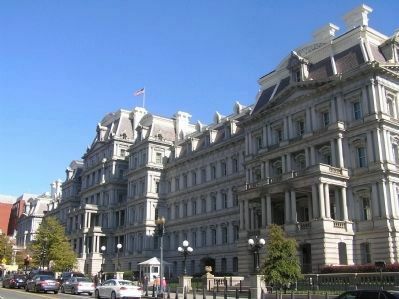 Old Executive Building (west side). More. Search the internet for State, War, and Navy Building. Credits. This page was last revised on June 16, 2016. This page originally submitted on December 15, 2007, by Craig Swain of Leesburg, Virginia. This page has been viewed 1,405 times since then and 4 times this year. Last updated on January 12, 2014, by Richard E. Miller of Oxon Hill, Maryland. Photos: 1, 2. submitted on December 15, 2007, by Craig Swain of Leesburg, Virginia. 3, 4, 5. submitted on November 11, 2013, by J. Makali Bruton of Querétaro, Mexico. • Bill Pfingsten was the editor who published this page.